A German Beef Soup Recipe with Bone Marrow Dumplings. This Homemade Beef Soup is called Rindfleischsuppe. 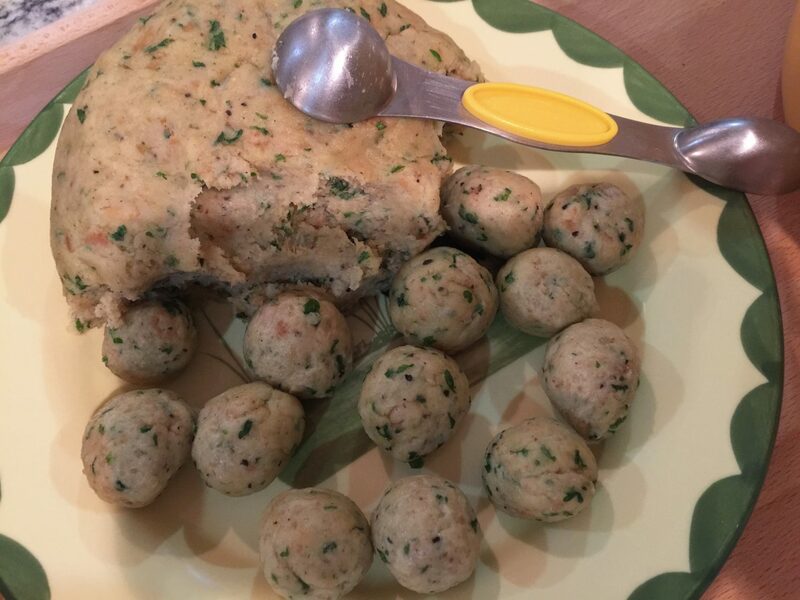 The Bone Marrow Dumplings are called Markklöβchen. Rinse the meat under running water and dry with a paper kitchen towel. Fill a large saucepan with cold water and add two teaspoons of salt to it. 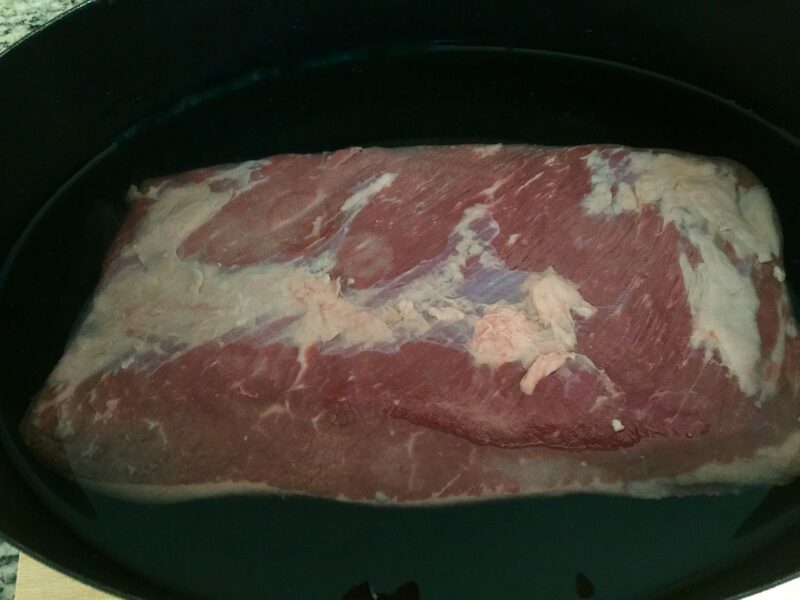 Place the meat in the water with the fat side down and bring to boil. Wash the tomatoes, parsley, and the leeks (cut them lengthwise in the center, so that you can get in between the leaves to clean). Peel the carrots and celery with a potato peeler. 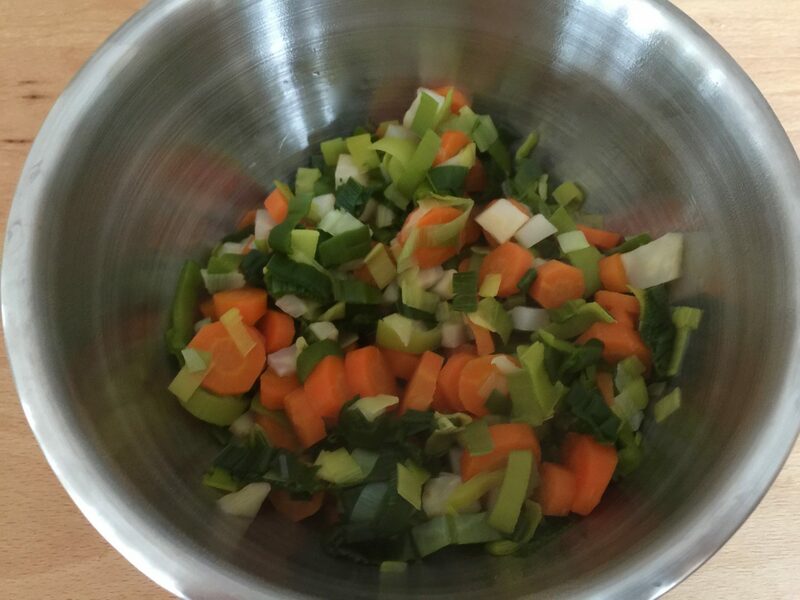 Cut the vegetables in chunks and add them to the broth. Once the soup starts to boil, turn the heat down and let it simmer for about 30 minutes. Next, turn the meat with the fat side up and let the broth cook on low heat for another 2 ½ – 3 hours depending on how tender you prefer your meat. Check at regular intervals on the soup and replace evaporated water, so that the meat is always covered with water. 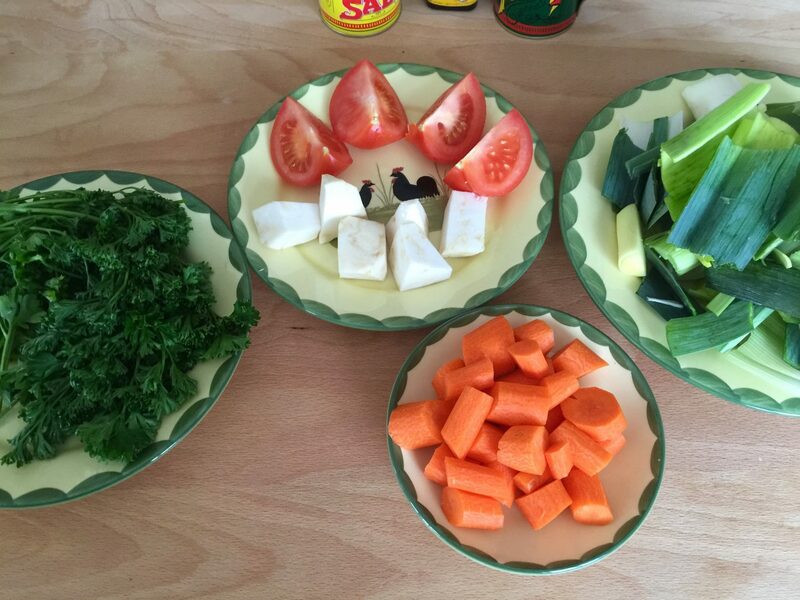 In the meanwhile prepare the additional ingredients for your homemade beef soup. Peel the carrots and the celery root. Clean the leek leaves (as described above). Dice the vegetables in small pieces. Add some salt to a saucepan with water and cook the vegetables for about 15 minutes. Drain the vegetables in a colander and set aside. In another pan, bring salted water to a boil and cook the fine noodles as described on the package. Drain and place aside. Prepare the bone marrow dumplings as described (click here for recipe) and put them aside. 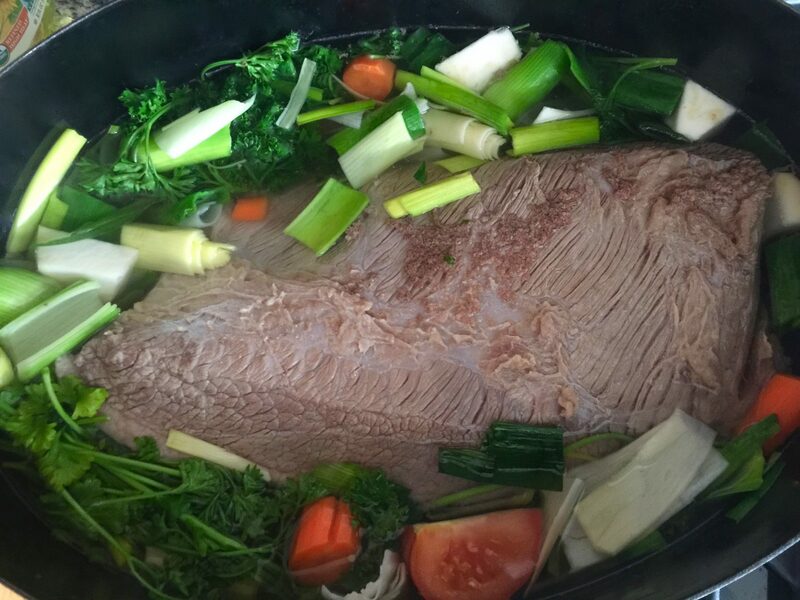 When the broth has cooked for approximately 2 ½ – 3 hours, take the meat out and place it on a plate. Remove the fat and let it rest. Pass the broth through a sieve and into another saucepan. 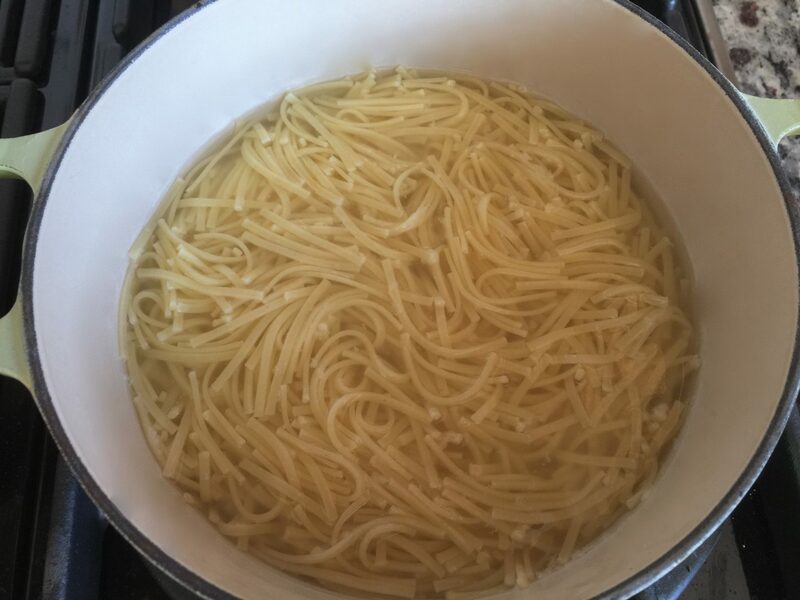 You should have about 1 ½ l – 1.58 qt of broth. (Don’t use the vegetables cooked in the broth). Add about 1 teaspoon of salt to the broth and bring it back to a boil. Add the soup extras to the broth. Add the bone marrow dumpling to the boiling broth and turn the heat down. The dumplings are ready when they float to the surface (about 10 minutes). Season your homemade broth/soup with some pepper and Maggi, a German liquid seasoning that you should find in the international section of your grocery store or online. You can either add the noodles to your homemade beef soup or place them on the table in a separate bowl for your guests to serve themselves. My personal rule is: If I have dumplings in the soup, I serve the noodles in a separate bowl. If I do not make dumplings, I add the noodles to the soup before serving. Finally, slice the meat with a sharp knife or an electrical knife. Your homemade beef soup is now ready to be served with the meat, dumplings, and the noodles. Accompany this meal with a fresh loaf of bread, or try Oma’s Baguette. You could also serve the meat with Oma’s homemade Horseradish Sauce, Savoy Cabbage and potatoes and use the soup as an appetizer. To find a complete Traditional Sunday Meal click here.